Seven crews arrived in Welshpool for round 4 of the ST Trophy. There had been some rain on the lead up to the event but the sun had managed to show itself for the Saturday, even resulting in dusty conditions as the day progressed. 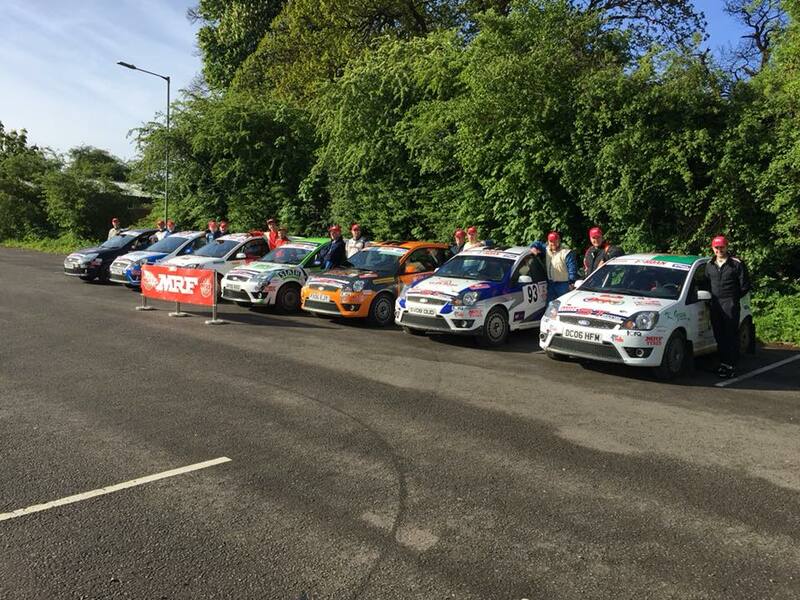 8 Stages lay ahead of the crews in the classic Dyfnant & Gartheiniog forests. Zak Hughes & Tom Wood led the crews away, Zak had fitted a new engine after his incident with a log pile on the Severn Valley Stages. Following crews had reported seeing smoke from the car early on and sadly for Zak & Tom the new engine cried enough during stage 2 so their rally ended with an early bath. James Giddings & Sion Cunniff were next away at set the early pace, pushing hard to arrive at service after stage 4 with a 13 second lead over Martin Laverty. Unfortunately some mileage had been lost due to a bad accident on Stage 3. Kalvin Green & Osian Owen were third Fiesta away and despite their best efforts were off the pace in the opening stages arriving at service in 6th place and needing to gather their thoughts ready for a much needed attack of the afternoon stages. Mat & Tim Tordoff were next into the stages and were gaining more and more confidence in the new car with each mile. Mat had a steady first stage but then increased the pace and they arrived at mid point service still holding 3rd place and only 1 second behind 2nd place Laverty. Martin Laverty & Phil Kenny seemed to have left their bad luck behind them and were rewarded with 2nd quickest time on the opening Dyfnant stage. They kept up the pace and arrived at service in 2nd place 13 seconds down on Giddings but with Tordoff only 1 second behind them it was going to be an interesting afternoon. Ewan Tindall & Paul Hudson were the next away, a new crew to the Championship, Ewan only having past his driving test 2 weeks before the event. Ewan & Paul had moved up from the Junior leagues and this was to be Ewan's first outing in the forests and gravel. Luckily for Ewan, Paul Hudson has plenty of experience and would be a good guide for the youngster. This mix of young and old experience seemed to be paying off and the crew settled in to a quick pace which was getting quicker with each mile, arriving at service in 4th place but with only 4 seconds up to Laverty in 2nd they had a chance of a podium in their sights. Final ST crew over the start ramp were straight talking Yorkshire crew of Neil Fewlass & Stephen Varey. Neil still getting used to left hand drive and front wheel drive. Neil & Steve arrived at the service halt in 6th pace 29 seconds behind Kalvin Green with just one thing on their mind, eurovision! The crews all attacked the afternoon stages which was a re-run of the morning loop and despite a hold up all the mileage was there for them to fight it out. Green & Owen went on a rampage, throwing caution to the wind and aiming their sights high they managed to claw their way back up the leader board and with a bit of luck overhauled the leaders to come home as victors taking some well earned Championship points. Giddings & Cunniff were comfortably leading until their gearbox mounting broke, they stopped on a road section and strapped the engine up, sensibly dropped their pace in the remaining stages to make sure they got to the finish. Their lowered pace handed the victory to Kalvin & Osian but they fought to the end finishing only 7 seconds behind but took valuable points with their 2nd place overall. Ewan & Paul had settled into a good rhythm and kept upping their pace stage by stage to slowly move up the leader board, with veteran Hudson on the notes and keeping Tindall in check they came home with a very respectable 3rd overall just 5 seconds adrift of second place Giddings. Martin Laverty & Phil Kenny had slowly slid down the leader board as the afternoon went on and came back to Welshpool in 4th place just 2 seconds ahead of Mat & Tim Tordoff, the 2 crews had been within a hand full of seconds all day. Fewlass & Varey came home in 6th place and with more experience under their belts will be hoping to improve on the next round. Sadly with the late finish of the event Neil had to miss The Eurovision Song Contest! The Championship moves to the fast stages of Kielder for the Carlisle Stages on June 9th. Keep up to date with everything ST Trophy on our Facebook page.